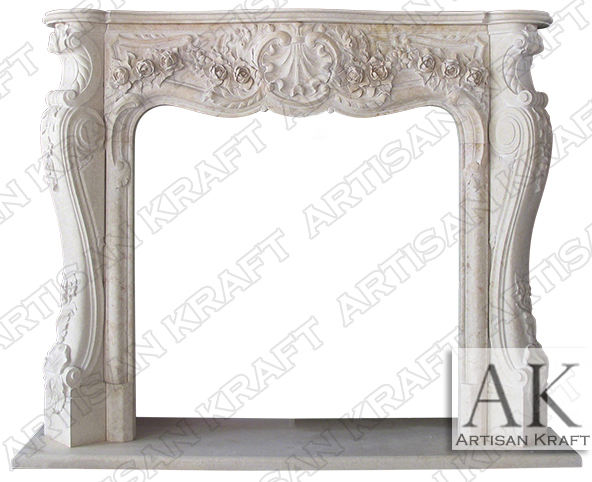 French style fireplace pictured in Egyptian Cream Marble. Mantel is polished. Decorative carvings are hand carved details. As regal as the mansions and Chateaus in France that it can be found in. This is a very popular mantel and we keep it in stock. There is one antique replica currently available in white marble. While the design is French you can have it shipped to you in 1-3 weeks. Beautiful fine floral carvings with great details. A Baroque French design surround. The Victoria is priced to sell. Great for a Chicago town home or a New York mansion in the Hamptons. Similar styled also stocked.